I started writing songs out of a love of language, poetry and my family’s music history – at least I think that’s why. Some things you’re just drawn to – and songwriting for me is one of those. Poetry is about discovery through detail in a moment. For me, songwriting is about the same – the speaker and the connection to the thing being brought forth. Because an emotional tie is important to discovery, being able to really see the thing being talked about is a key ingredient to vivid imagery and moving the process forward. 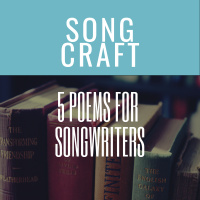 Below are 5 poems for songwriters. These are poems I love and go back to often. They help you stay connected to the building blocks of songwriting in addition to your perspective on life and the things around you. We’ve talked about writing a literal scene and focusing on details. Note the single vantage point -in a hammock. It’s not a vast scene, just one contained to the speaker’s field of view. This isn’t a long poem, but you’re immediately with the speaker in a hammock. We have to do this often when writing verses. Note how Wright does it – strong, specific detail from the first line. Granted, he uses the title to avoid having to use a line to set the scene: an advantage of poetry over songwriting. But this is a great example of writing as much detail into as few words possible. One of the U.S.’s greatest poets, and Pulitzer Prize winner Mary Oliver is a writer/poet I’ve always admired and seen as a primary songwriters “how to” resource. The inspiration for many of her poems is Provincetown and it’s diverse ecology. She is a lover of the area, it’s land and the living things there. Her poems are observation and evocation done well. Mary Oliver talks a lot about “money words” in her book Rules For The Dance, and the value they bring to a poem: how verbs and nouns are worth $0.25, while adjectives and adverbs $0.01. I think that’s one theme you’ll see throughout all of these poems, but particularly in hers. She’s extremely aware of the value each word brings to the poem. What if you did the same with your songs? Go through and calculate the dollars associated with the language! This is a terrific poem that starts with a simple evening walk. It illustrates the power of observation and letting your mind go, making connections to memories, emotional ties and thoughts by noting the detail of a thing or moment. The dense language heavy with nouns and verbs will give you a sense of the power object writing exercises can have on your craft. As the speaker becomes the bear, the poem shows a keen ability to see the world from a different perspective. Suzanne Vega’s “Small Blue Thing” is a great example of “becoming the other“ by changing a song’s perspective and putting oneself in the position of seeing the world differently. This is a great songwriting challenge if you’re ever in a rut. Be something else and tell the story! This poem is mesmerizing. You are standing in the dark with the speaker, making a decision that touches the core of what it means to impact those around you. William Stafford’s poems are often about the common things in life, but his use of imagery brings the hidden aspects of it to light in a way that creates an emotional tie to the reader/listener.